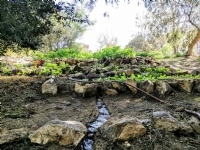 I am writing this on behalf of the Arad Botanical Garden, located in Arad, Israel. We are an organization based in Arad rebuilding the commemoration for Ethiopian Oleh Hadash, and have a mission to build the 4th botanical garden in Israel, as well as expand and re-beautify the gardens and repurpose them to be inclusive for all Oleh Hadash and people who wish to come to Israel to call a sacred place of their own. We are looking for this spring to resolve the operations we started- namely to finish the landscaping. I would like to ally the botanical garden, and future ones, with congregations around the world, and I would like Harford Chabad to be a part of it. Because Rabbi Kushi Schusterman, is my mentor. This is in large part because in my time spent in recovery in Bel Air, the time I was with Rabbi Schusterman was integral toward me both healing, finding myself, and determining to move to Israel and make Aliyah to start over. My hope is the synagogue will find itself further supporting its second home and the development of Eretz Yisroel - Israel- tying the Jewish people , to the Jewish land, and the Torah! Of course, if the synagogue would like to do more, this could be discussed and done, but the main goal is finding a more secure link so we can import seed stock directly on site. So in essence, this partnership allows the synagogue to take part in what we are doing, by enabling us to do so. It is not a financial partnership, but one in actuality that is focused on enabling the work we do here. We will purchase these supplies, and the hope is to send them to the congregation or community and then have them sent to our locations in Israel, currently limited to Arad, but we seek to expand. We are interested in setting things in stone, both literally and metaphorically before the warmer seasons.